[ #Vray ]Are you looking for the opportunity to learn more about V-Ray 3.0 for 3ds Max and V-Ray 2.0 for Rhino and their use in design? Join Chaosgroup for a day dedicated to stunning designs and advanced visualization technologies. 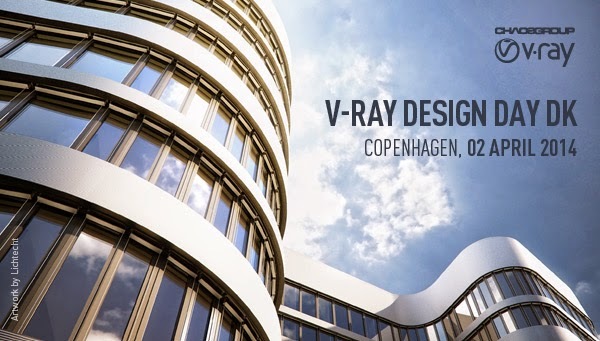 In the morning, V-Ray Master Trainer Vassil Pepelyankov will demonstrate the new features and improvements in V-Ray 2.0 for Rhino, such as performance up to 30x faster with V-Ray RT, new V-Ray Express presets and easy matte creation with V-Ray Wrapper. Lucian Racovitan of BIG Architects will reveal how V-Ray for Rhino helped him visualize a 69,000 m2 office building for startup companies. The project was created for a recent competition BIG did for Europe Axel Springer for their new HQ in Mitte, Berlin. The second session of the event will focus on V-Ray for 3ds Max. Vassil Pepelyankov will showcase speed improvements in V-Ray 3.0, including new progressive image sampling and how to create and work with the new XLM-based materials, plus sharing V-Ray shaders across multiple applications using VRmats. Allan Andersen of CADesign will show projects breakdown and will share some of their experience working with V-Ray for 3ds Max.